With land becoming scarce and more expensive to purchase and the growing awareness of limiting the impact of homebuilding on the environment, narrow lot house plans are becoming more popular. Over time, home building sites have decreased in size placing a higher demand on narrow lot home plans, allowing them to evolve into what they are today. With today’s designs, there is no need for home owners to sacrifice comfort, special features or livability. Narrow lot house plans deliver all these things and more while keeping the budget in mind. If you are faced with the challenge of building on a narrow strip of property, take a look at the list below outlining the qualities of narrow lot house plans that make them attractive to a broad range of homeowners. 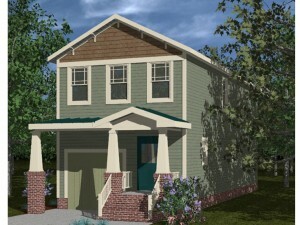 Designs in our narrow lot home plan collection have a maximum width of 40 feet. What they lack in width, they make up for in depth. Floor plans are long and lean with no limit of depth. Narrow lot house plans are applauded for having a minimal impact on the environment. Their small footprints require less green space while still allowing “a lot of home” to fit on a small lot. This leaves the surrounding land undisturbed. These homes are recognized for being eco-friendly. Floor plans are economically designed to make efficient use of interior space. They make use of every square inch of space offering maximum storage in the form of closets and built-in cabinets and shelving. Often, gathering areas are open to one another with few walls creating a spacious feel. Floor plans incorporate many of today’s most requested features like main floor laundry rooms/closets, kitchen islands, outdoor living spaces, energy-saving elements, deluxe master baths and more. Many narrow lot house plans incorporate a garage. Narrow lot home plans have a linear floor plan. They can be one or more levels and range in sizes from a couple of bedrooms and baths to four or more bedrooms and baths. One-story designs often feature one long hall grouping the living areas at one end of the home and the bedrooms at the other for extra privacy. Two-story designs are ideal for property with limitations allowing an opportunity to add square footage economically in the form of a second floor. These floor plans often position the living areas on the main level and the sleeping areas upstairs for privacy. Narrow lot homes are found in densely populated areas where land is precious and houses are built close together. They are frequently built as replacement homes on in-fill lots in older urban areas. 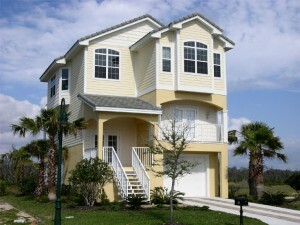 Narrow lot house plans are available with various foundation types and come in a vast array or architectural styles. Honoring the restrictions of a narrow lot, these house plans are sometimes referred to as zero lot line homes. But don’t be fooled. Though they are often smaller in stature than their larger and more sprawling cousins, narrow lot house plans deliver the same comfort, style and features, plus they are environmentally friendly and often deliver more economic construction. Visit our narrow lot house plan collection to view floor plans in a broad range of sizes and architectural styles including beach house plans, craftsman house plans and everything in between.